Makandure Madush well and truly trapped and taken into custody in Dubai! 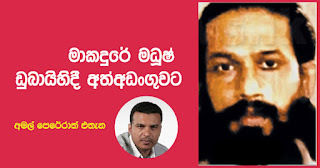 Underground leader Makandure Madush who was the most wanted person because of his underground activities in Sri Lanka was finally taken into police custody with 25 persons connected to underground dealings and was arrested with narcotics in possession at a hotel in Dubai, it is reported. Madush, Kamburupitiye Madush, Matara Madush while his real name was Samarasingha Aarachchige Madush Lakshitha. Among the people taken into custody were Kanichapani Imran, Keselwatthe Dinuka and a popular singer in Sri Lanka, Amal Perera. After the murder of Mr. Danny Hiththetiya, a former chairman of Southern Development Authority in the year 2006, Makandure Madush has vanished overseas and was responsible to commit narcotics dealings and looting which shook the entire country.